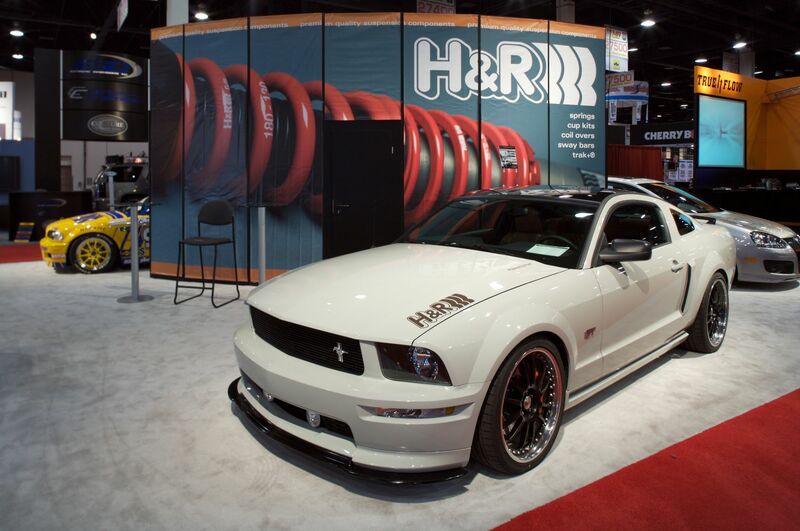 H&R Ford Mustang HR1-FMJ | H&R Special Springs, LP. 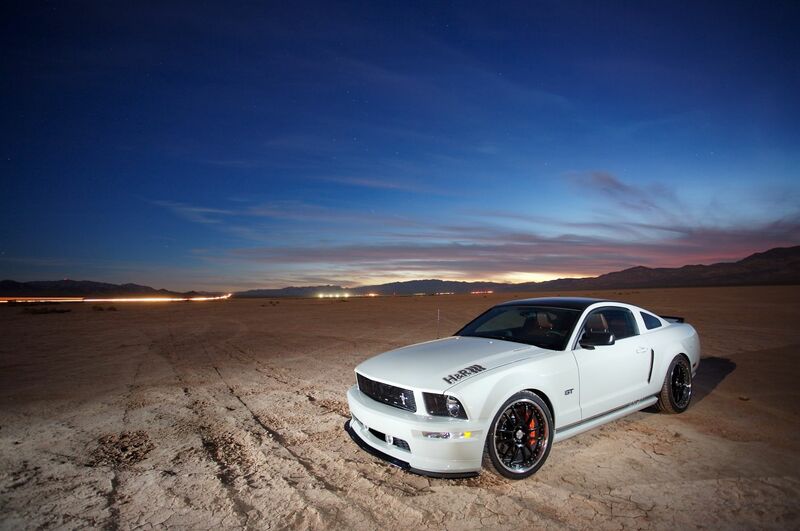 ‘FMJ’, the most recent H&R Mustang project, debuted at the 2006 SEMA Show with huge success. 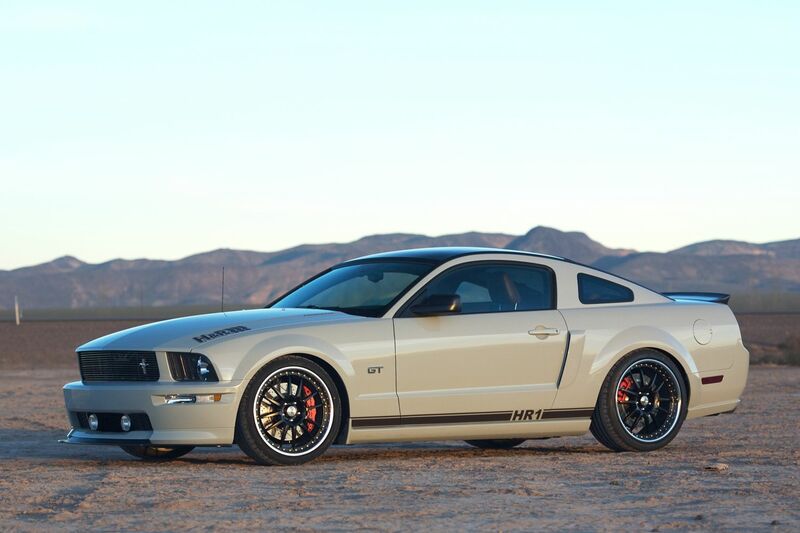 Drawing from a rich heritage of high performance Ford Mustangs, the H&R ‘FMJ’ project – short for “Full Metal Jacket” which is a type of bullet – is inspired by the 1960’s movie Bullitt and its namesake Ford Mustang. 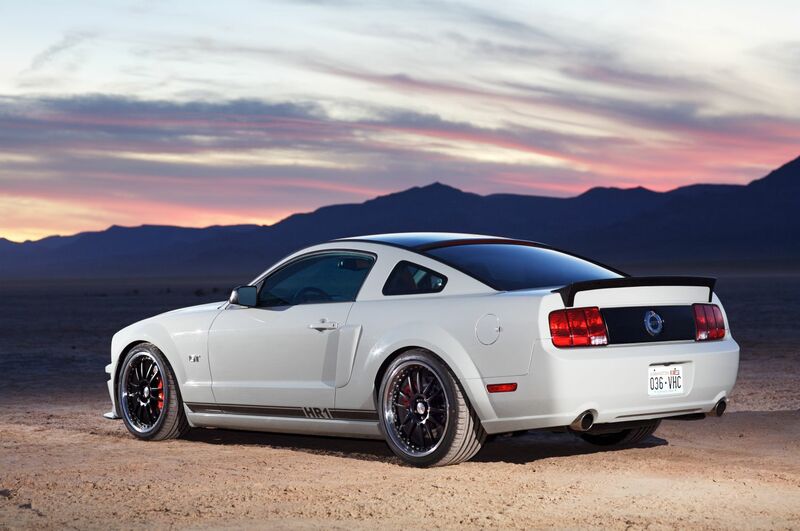 The subtle ‘less is more’ styling of the Bullitt era is embodied by the ‘FMJ’ project. 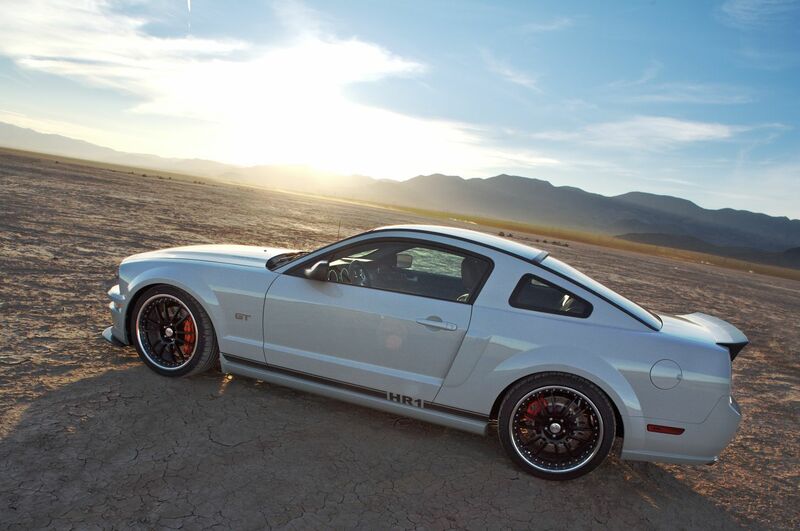 Subtle styling cues include the custom black satin finish Shelby billet grille and California front spoiler with custom purpose built front splitter. 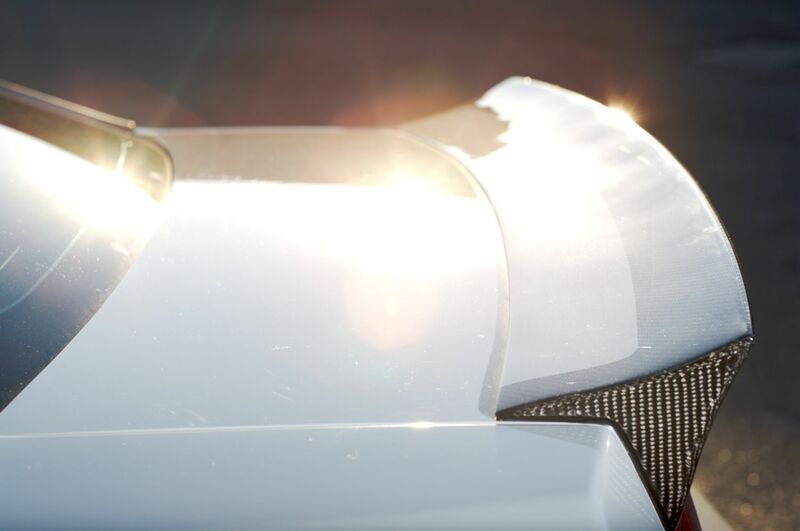 In the back of ‘FMJ’ a carbon fiber rear lip hides the factory third brake light and an integral LED brake light has been seamlessly integrated into the rear of the awesome all-glass Glassback roof. 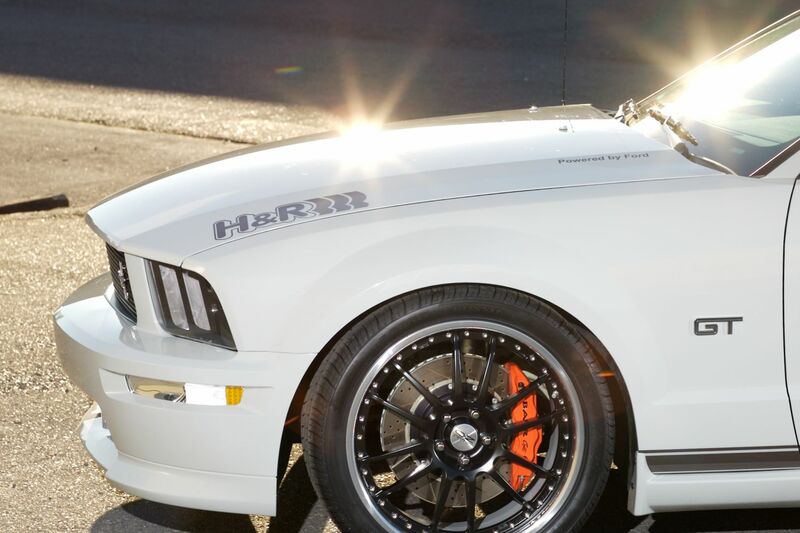 This “subtle”, yet distinct, H&R built Mustang is most notably set apart from the pack of gaudily painted and stickered custom Mustangs with its restrained light grey paint – a 1950’s Porsche 356 Speedster color. 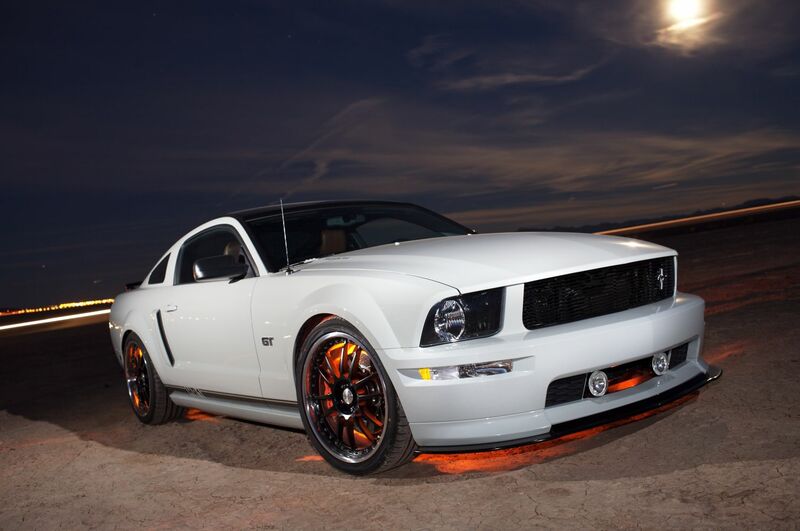 Current power upgrades include an SCT re-calibrated engine control computer, MRT cold air intake, and stainless steel H-pipe and hi-flow catalysts with Flowmaster mufflers. 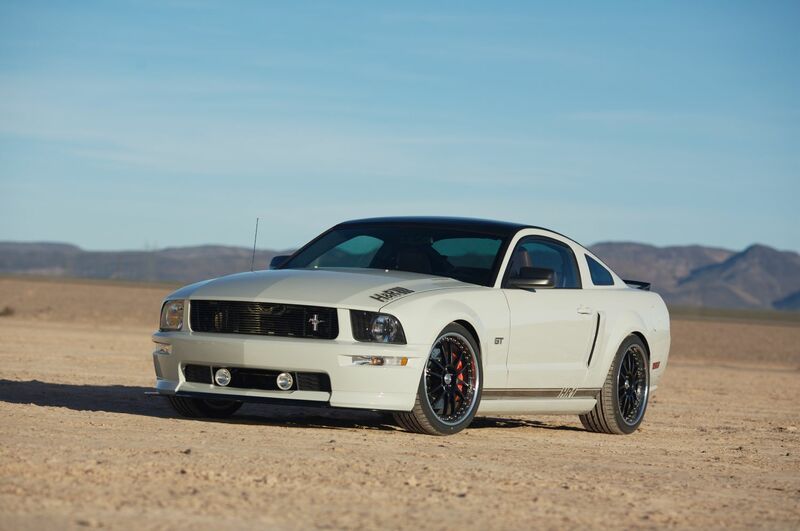 For improved acceleration, the ‘FMJ’ differential has been re-geared to 3.73:1 and is now enclosed with a new Ford Racing differential cover and body color powder coated rear axle. Motul fluids keep all the power parts well lubricated and at peak performance. 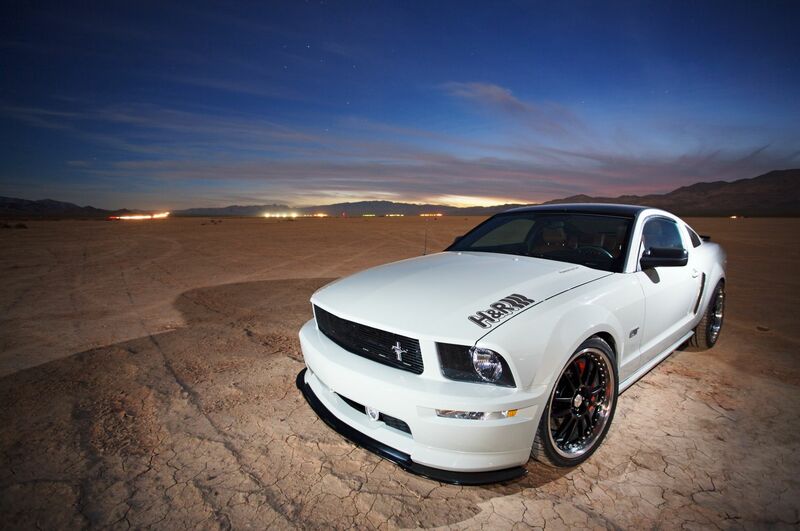 The H&R ‘FMJ’ Mustang isn’t just fast in a straight line though. 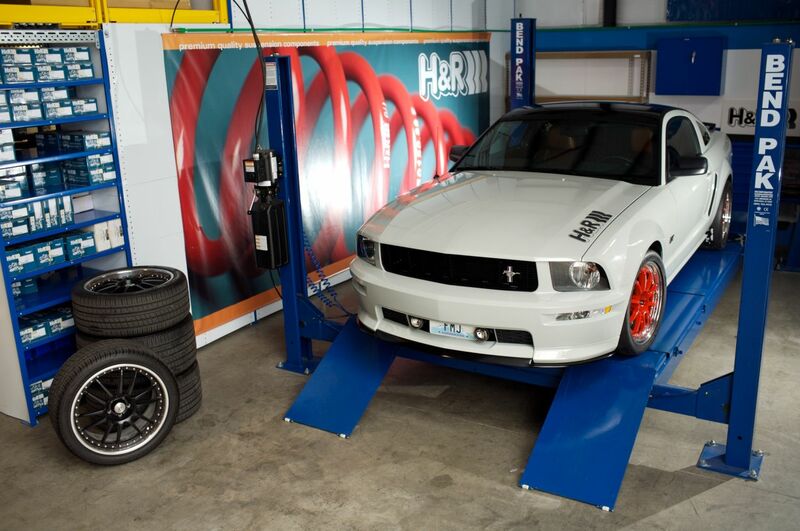 H&R has developed premium suspension and sway bars for the Ford Mustang GT that elevates the ‘FMJ’ handling into a league of its own. 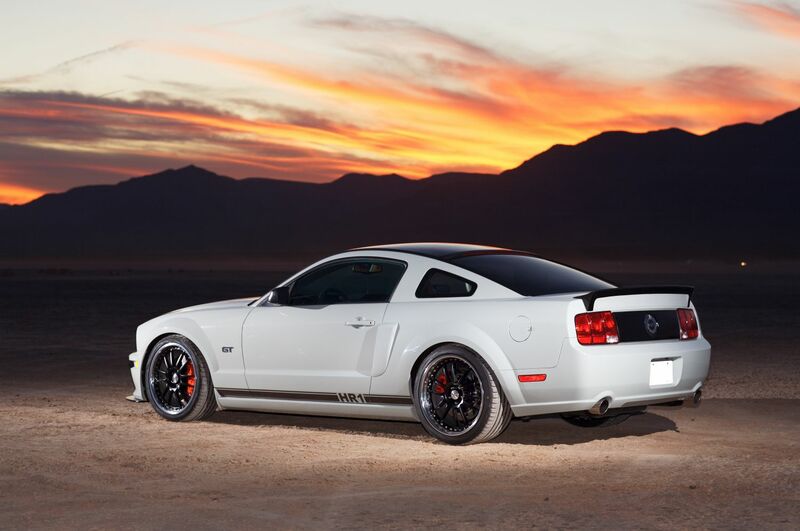 Unmatched performance and comfort is provided by specially designed height adjustable H&R coil overs for the Mustang GT, allowing both front and rear ride height adjustment. 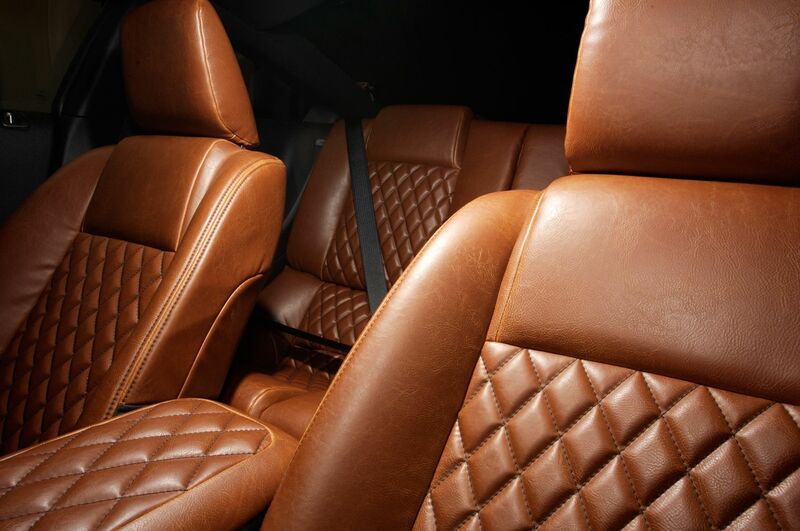 The rear is fitted with easy to use H&R exclusive height adjusters that allow easy adjustment to the rear ride height. 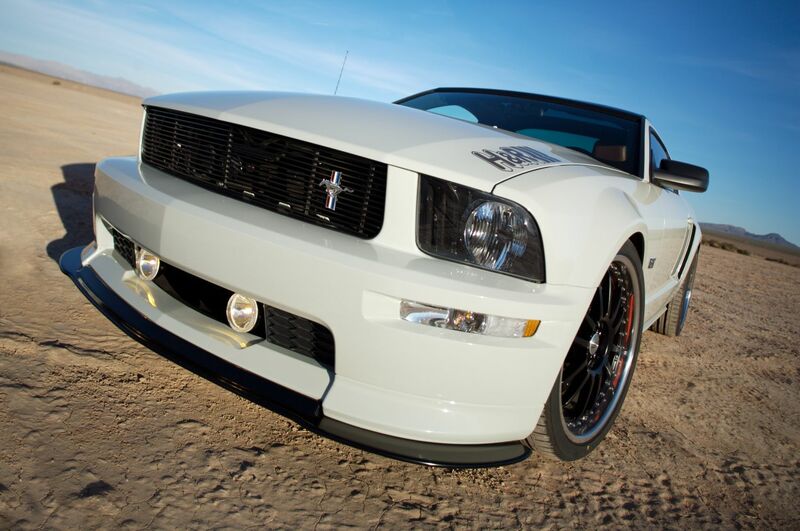 Huge H&R sway bars – measuring 36mm front and 26mm rear – minimize body roll and increase traction in the turns, allowing ‘FMJ’ to harness the full performance potential of its massive wheels and tires; Custom O.Z. 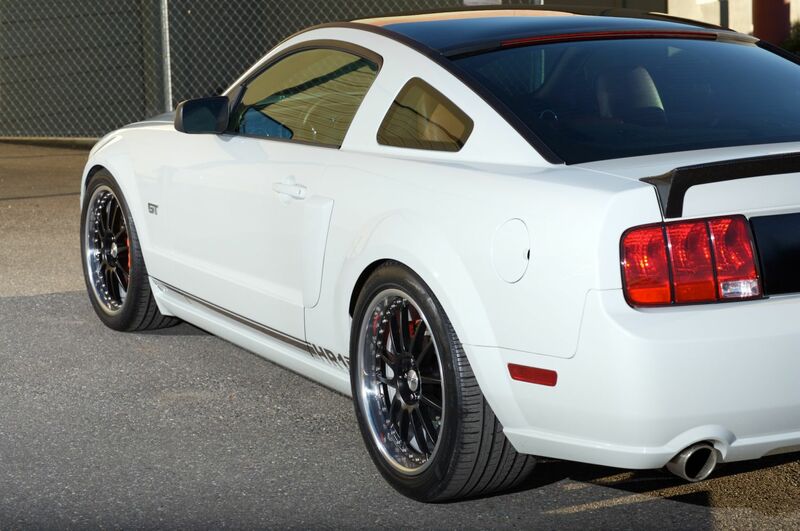 Superleggera III wheels with matching satin black centers from the Tire Rack – measuring 9 x 20 inches front and 11.5 x 20 inches rear – allow the fitment of stream roller sized Pirelli Pzero tires – 275/35R 20 front and 315/35R 20. The tread width of each rear tire measures 12.6-inches making a combined width of more than 25-inches of rubber on the ground! 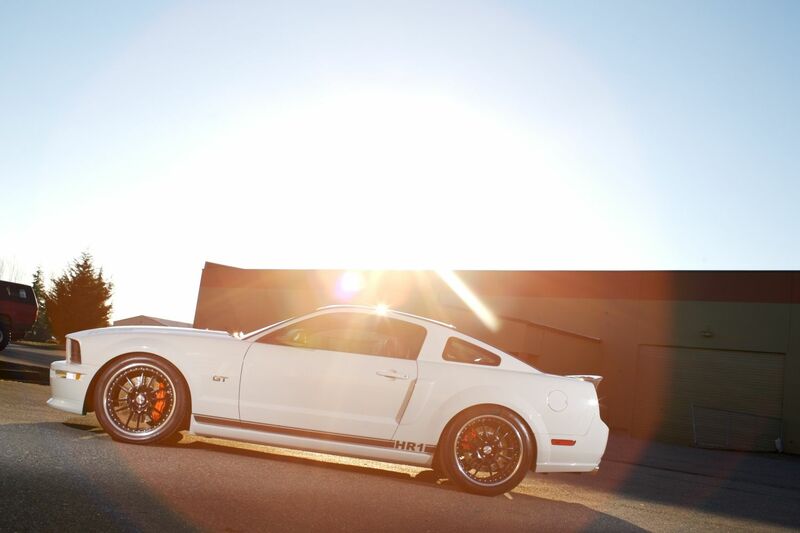 To harness the full potential of the tremendous amount of rubber on the ground, massive Baer brakes were fitted – the rotors measure 15-inches front and 14-inches rear! 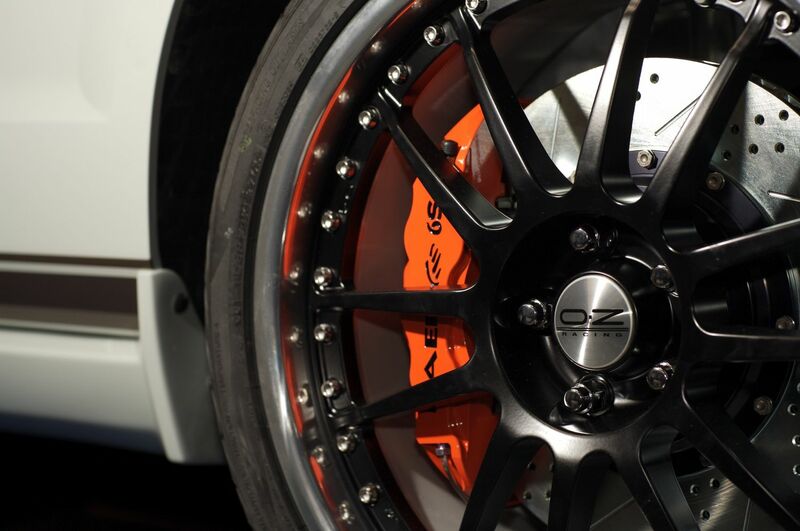 Bright orange painted calipers create a nice accent and provide a good indicator of the stopping potential hidden within. 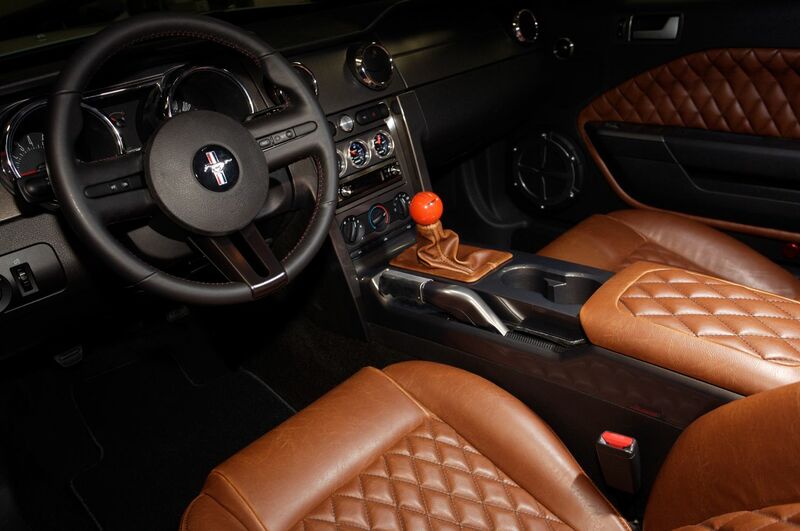 And of course no serious project vehicle is complete without interior modifications and the ‘FMJ’ Mustang is as serious as they come. 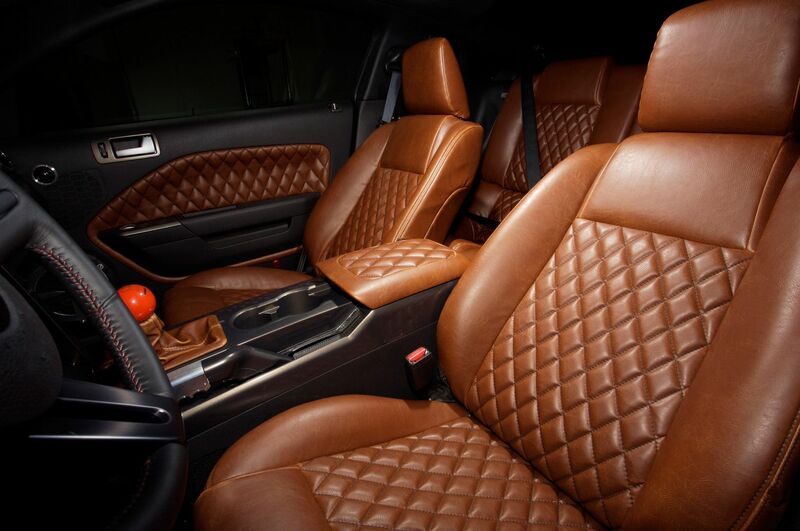 The interior features an over-the-top look with its dark brown stressed leather and diamond stitch pattern on the seats, door panels, and center console. 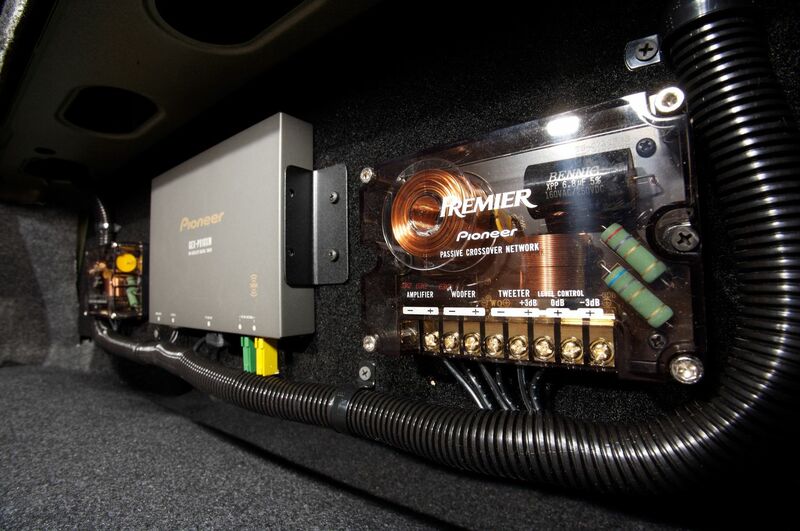 A complete Pioneer Premier Audio system was installed for optimum sound imaging. 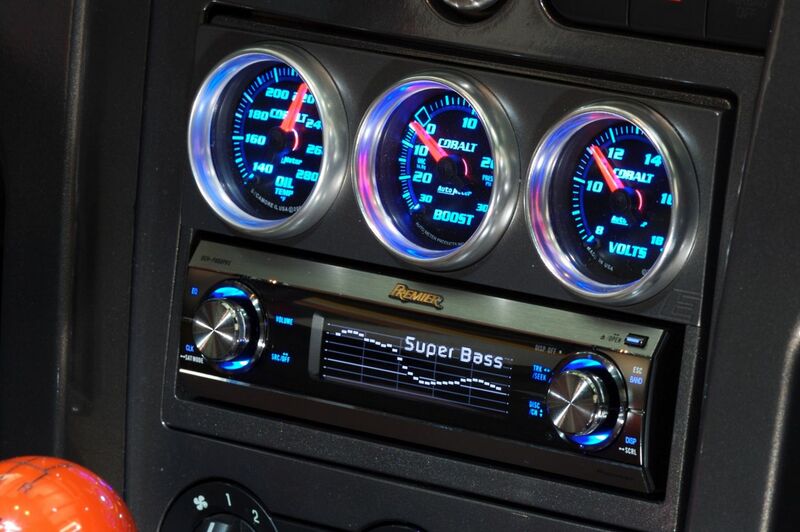 Controlled by a Pioneer DEH-P880PRS head unit, the system features three Pioneer amps for a total of 2400 watts power, interior style matched tweeters, and a 12-inch sub. All the components were chosen for their clean lines and visuals that match the ‘FMJ’ project theme perfectly, controls all. 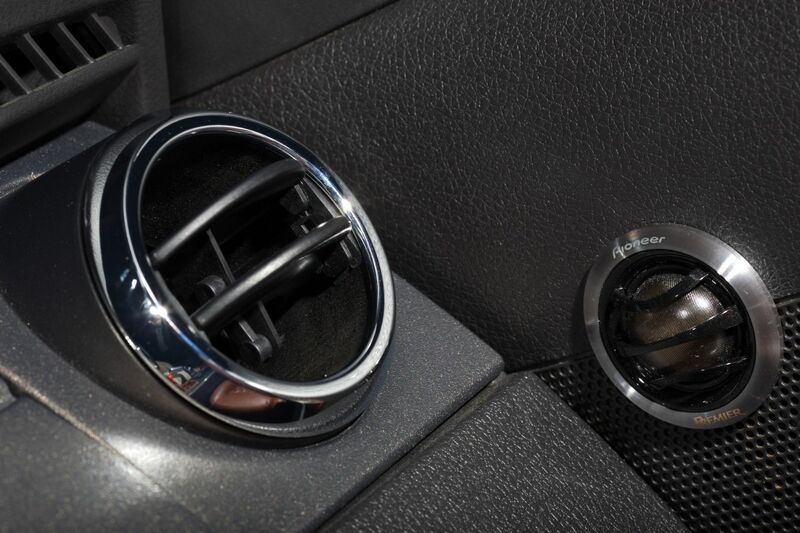 A few finishing touches to the interior include a Custom gauge panel above the head unit – fitted with three Autometer Cobalt gauges: Volt, Vacuum, and Engine/Differential Oil temperature – and an MRT orange shift knob. 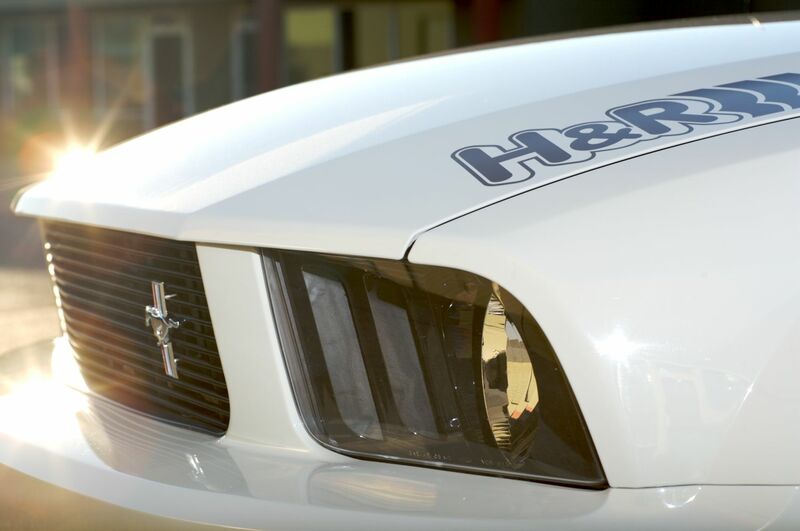 The H&R ‘FMJ’ Mustang debuted with rave reviews there was something for everybody, from the subtle styling to the awesome interior and modern audio system. ‘FMJ’ proved to be right on target! 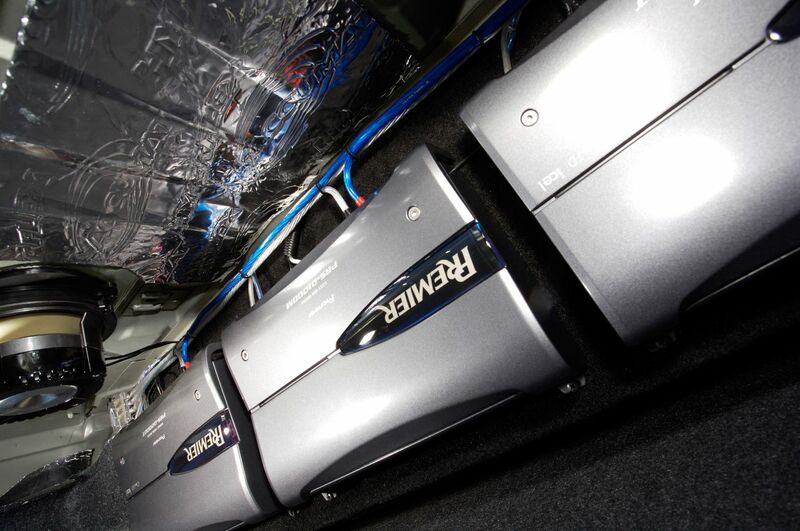 :: LED Under car security/courtesy lighting – white LED lights come under the sides of the car when the door is opened.